Despite its reputation as the ultimate hipster haven, Williamsburg has a lot of attractions for folks too young to grow soul patches. The neighborhood is filled with funky children's boutiques, laid-back restaurants, colorful play spaces and cool live family entertainment. Williamsburg also boasts the fantastic 35-acre McCarren Park featuring playgrounds, sports fields and a newly renovated pool. Our guide to Williamsburg includes suggestions for things to do and places to go both in the more gentrified Northside and the homier South Williamsburg, which boasts a more old-school NYC vibe. Although a bit spread out, it's a wonderful area to explore. 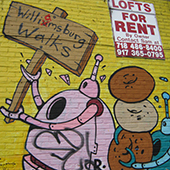 You'll spy vibrant street art, artsy residents hanging out at cafes and lots of other families, just like you, enjoying the all of the cool things Williamsburg has to offer.